If you’d have seen the wifely lately, you’d know a bit about what we’ve been working on due the color of her hands. *wink* For those of you who haven’t had the pleasure, we’ve just made these pretty (and rather large!) quilt block boards. 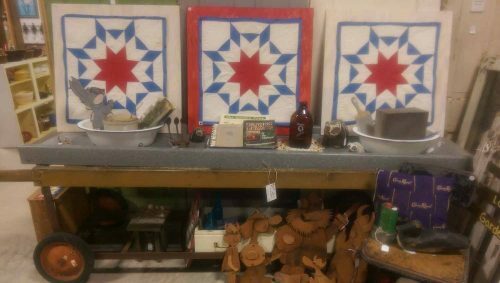 Each board features a red, white, and blue star quilt block. The boards are stained either red or white. Each measure board measures 29 inches square. It was the best way to salvage the quilt. Perfect for quilt lovers, fans of Americana — and, of course, just in time for the Fourth of July! 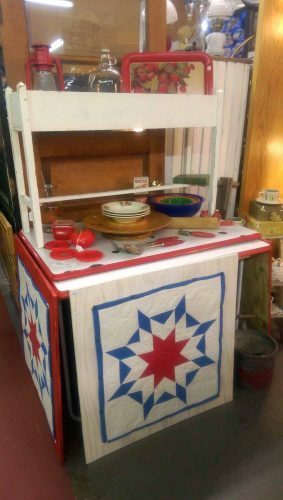 That 8-foot long primitive industrial cart, vintage Pigeon Forge Pottery racoons, and a collection of vintage handmade, wooden Hagar The Horrible characters! We were on the radio again. This time, I joined hubby on KFGO and we talked about picking during Fargo-Moorhead’s Clean-Up Week.